We were hesitant and were reluctant to buy a "Unique Memory Foam mattress" site unseen or tested in person thru an online purchase - especially when we were plopping down over $500. on a King Size version - BUT after reading so very many positive 5 star reviews about this product, we decided to take the plunge. We have been sleeping on the mattress for over a week now and all my husband and I can say is "OH MY GOD - this is THE best mattress experience we have ever had". To read in Overstock's advertisement that this mattress "will provide deep, relaxing sleep; The Pillow top provides the ultimate in Memory Foam surface feel and comfort; Uncomfortable pressure-points common in most innerspring mattresses is eliminated" is a HUGE understatement. We could only hope that half of it were true. Well, it is ALL true and then some. We are a couple who have been together for over 25 years. Being "baby boomers" we have come to distrust so much that you read in ads and what the advertisement claims the product is capable of doing. Well, this mattress has certainly come thru and has restored our faith in advertisement...at least here on Overstock.com. One only has to have lived thru many years with the tossing and turning of another partner in bed with you to know that reading the statement "Say goodbye to the motion transfer you've learned to live with" would be a dream in itself if it were true. Well, it's true. Quite frankly, I didn't think there was a mattress capable of having a bowling ball dropped on the bed and not being able to notice it if you were lying down on it, but I know this mattress would withstand the movement as I no longer feel my husband moving at night (nor he of me moving at night). What the advertisement neglects to mention is you don't hardly move at all during the sleep cycle on this mattress. Once you lie on it, you become so comfortable you can forget about reading in bed or watching TV for any length of time as you are so comfortable, you are asleep in less then 10 mins. The beauty of never having to remember to turn the mattress is another plus along with being able to use our existing box springs without having to incur the cost of new ones was a selling point for us also. When we received the mattress - in less then a week - it was packaged exceptionally well. My husband and I were able to carry the mattress from the front door to the bedroom without any problems. Once unbagged according to the directions,(AND of note - there was NO SMELL whatsoever; a large concern for us as I am asthmatic and have a horrible time in the winter months) we put the mattress on the bed and left for work. When we returned there was no smell whatsoever and the mattress had completely puffed to a nice 13 inches (not 14 inches as noted but who cares about 1 inch). I was concerned our current sheets wouldn't fit but they did with no issues, but they had come off of our Thomasville Pillow Top Mattress and were on the "deep pocket" size already. This is certainly something you may want to take in to consideration if you are thinking of purchasing this particular mattress - it is thick. Just buy some deep pocket sheets if you don't already have some while you are waiting for the mattress to arrive. Sum total of it all: We have slept so well since the first night on this mattress. We wake up with more energy and my husband's back pain is no longer an issue upon rising. He is so pleasantly pleased. Do yourself a favor, especially if you are like us where we product review for months on end when we are going to be making a major purchase, get this mattress while it is still for sale at Overstock.com. You really, really, really, can't go wrong. This is everything it said it was. We looked at $2400.00 memory foam matresses in the store and this is the same quality as those. Nice cover 6 inch memory foam top not just 3 inch. It regained its shape in 6 hours and was exactly the measurements that were listed in the description. Highly Recommend. My husband and I were so sore from our previous innerspring (although 20 inch and costing over $1500) mattress. We decided to go for this 14 inch king memory foam mattress. When it came, there was no odor (as others had mentioned) and the mattress was in perfect condition. One thing I did notice, and actually chatted with Overstock C/S rep to check on, is 3 inches of the memory foam is actually sewn into the lower core portion of the mattress - then the 2nd 3 inches is on top (it almost looks like the core urethane is higher than dimensions given and lacking the full 6 inch memory foam topper). We have been sleeping on the mattress for a couple of weeks and we both sleep so much better! no transfer of motion, no sagging, and absolutely no sore bones in the morning!! What you see is definitely what you get - and we are just so pleased. Don't be afraid - GO FOR IT! Sweet dreams! So you are thinking about buying this mattress, but the reviews where it states it broke down prematurely or, the bed was too firm,presence of odor, or what have you are keeping you reluctant? Let me try and help clarify. I bought this bed and obsessed over the negative statements too. I bought it any way due to the overwhelming good reviews. Wise decision on my part. I love it. Yes, it s firm, not so firm that you are uncomfortable or ache due to the firmness. I purchased the 14inch with pillow top and friend, that pillow top is anything but firm. Now having this mattress in my home, I am inclined to believe that the complaints of the mattress being overly firm are stemming from customers who are not familiar with memory foam. In case you are not familiar with the nature of memory foam, please understand, it's texture (soft/firm) is extremely dependent on the temperature it is kept in. Think of silly putty, when you took it out of the egg, it was some what stiff, however, when you played with it the heat from your hands softened it and it was more easily molded. Memory foam is very much the same. With that statement I am in no way saying that there is no way previous customers received a bad mattress, but from reading the content of those reviews, the above is what I am inclined to believe. Now, as far as breaking down or premature body impressions, I have not experienced this, perhaps due to the included pillow top. Just remember, the foam is not invincible. Simply because something is new, doesn't mean it can be abused without consequence. So, if this is for a child, try your best to help them understand they should not stand nor jump on the bed. It isn't like it's made of paper, but it is not designed to have that much weight in such a concentrated area as small as a foot print either. So husbands, no standing on the bed to change that light bulb! Also, very important, foam is meant for a very sturdy FLAT surface. This means NO box springs by any means. Platform bed only. Box springs WILL make the foam break down and acquire body dips prematurely due to the bend and give. Also, box springs are not flat as they are typically an upholstered framework. Not good for foam. When the bed arrived at my house, the delivery driver rolled it out of the truck and said have a nice day. It was huge and obviously inconveniently shaped for 1 person to move, but surprisingly I was able to get it in and I have 7 somewhat large stairs going in to my house. So ladies, don't worry, You Can Do It!! It was rolled very tightly and looked like a large toilet paper roll as the outer layer of packaging is a cylindrical wrap of card board. When you take that off, there is a very heavy duty black plastic sheath. There are included instructions on how to open your mattress, but when you remove the black sheathing, if you are not prepare for what happens next, you may be caught off guard. Have the mattress on the bed prior to removing the black (outer) sheathing because once it is off, there is no going back. The mattress instantly 'grows' inside the inner sheathing once the outer sheath is off so attempt to be quick but careful so not to damage your mattress. I love this mattress, for the price listed you can't expect tempurpedic quality, but this mattress doesn't lack quality, there is no motion transfer, it is very comfortable, and look at that price! This was my first Overstock purchase, and since then, I have made many more purchases. Overstock has wonderful online tracking service so you know what stage your order is in at all times. All in all, an Excellent purchase. After test driving it myself, I have recommended this to my Mother, and as far as I am concerned, if it's good enough for Mama, it's good enough for anyone. Great Value and Surprisingly Well Made! I just received the 14 inch pillowtop memory foam mattress about 3 hours ago. The package weighs 126 pounds, but is very tightly packaged in a durable canvas bag. The directions say to allow 24-48 hours for the memory foam to fully expand. This mattess has already fully expanded to the 14 inches in less than 3 hours! I usually prefer a soft mattress, but reading the other reviews, I expected it to be pretty firm. It is very firm yet, it does conform to your body. For the price, it is surprisingly well made and the cover is removable for easy spot cleaning. This mattress when first opened, does not look like it would expand to 14 inches. Sure enough, it expanded very quickly! I would advise anyone who orders this product to make sure that they open it in the room that they intend to use it in. It is very heavy. Also, one additional note: this mattress was delivered by dhl and they delivered it to the wrong address which I figured out by carefully watching the delivery status of the package. They left the package on the front porch of a neighbors house two streets over. When I called, they were not very helpful at all. Luckily, my neighbor was very understanding and let me pick up the package off their porch. Beware, I would pay very close attention to the delivery once this item is shipped. Other than that, this experience has been great and I would definately purchase this mattress based on the value alone, not to mention the comfort level. We needed to replace our 10 year old mattress. We had used a memory foam mattress topper for the last three years. We had become quite attached to the memory foam comfort so decided to take a chance on a memory foam mattress. It arrived in a timely fashion and in great condition. We slept on it for a few nights and found it to be a little more firm than we had expected. We added a a 2 inch memory foam mattress topper to that and now feel our bed is pure heaven. 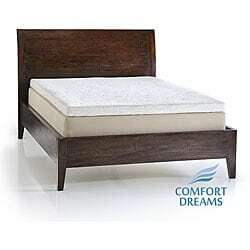 If you like memory foam this is great and the price can't be beat. We just received our 14-inch Pillow Top King-size Memory Foam Mattress and it is great!! Like everyone else that has reviewed this product, we were concerned about buying a mattress without trying it. But it is unbelievable and very comfortable. Within 5 days of ordering it arrived and looked like a big tootise roll. After opening it, it immediately started to expand. There was absolutely no odor. We were sleeping on it four hours after opening it. After the first night of sleeping on it, my wife wouldn't think of sleeping on any other mattress. We looked at other foam matresses that cost 4-10 times more than this one and decided to try it. We are glad we did. This is a great product. You won't be disappointed!. Is memory foam supposed to remember? I purchased this mattress in March of 08 and wanted to take my time to give an adequate review after having had the opportunity to really sleep on the product. Dont waste your money if you weigh more than 200 lbs. This mattress was great for about 3 months. It was everything we were looking for in firmness and comfort! Then it started to lose it's memory. 9 months later, my wife's side is as good as the day we unwrapped it. Unfortunately my side is sloped like a ski ramp. Because I'm a big guy (250) my side has caved in and will not remember what shape it's supposed to be in! Next time I'll spend my money on the real deal. Now I'm stuck with a mattress that wont support me. As soon as sit or lay on my side it collapses and fails to support. This is a great mattress for people that dont weigh in the 2's but if you do and need support and comfort, runscreaming and spend on another product! We bought this bed almost 4 months ago and fell in love with it the first night (I think it had something to do with the fact that our previous bed was so broken down so anything would have felt like heaven compared to it). My husband and I sat down and read every single review on this mattress before purchasing. We just didn't feel like we were making a wise decision buying a mattress without even testing it out........boy do I wish we would have listened to our gut. This mattress was good for a few weeks and then for about 3 months, I didn't want to say anything to my husband but my back was just killing me in the morning again (and I'm only in my 30s so that should not be happening). I kept it to myself and finally said something to him the other day and he started laughing b/c he had the exact same thoughts, he just didn't want to say anything to me either b/c we were so excited when we got this thinking it was such a great deal on a "memory foam" mattress. You truly get what you pay for so do NOT expect this to be ANYTHING like tempurpedic b/c it is NOT. My parents have a true tempurpedic bed and everytime I've been to their house since we bought this bed, I lay on theirs and it feels NOTHING like ours. So please, please, please do not expect this bed to be like the high quality memory foam beds. It got so soft within about a month so maybe if you like a very soft bed, then this is for you - otherwise, run FAR, FAR away. The other thing I noticed when we got it is that you can press your hand down in the mattress and with memory foam, you should be able to see your hand print then it slowly fades away as you lift your hand, with this mattress, you press your hand down and when you lift it, the mattress just bounces right back - it doesn't leave a print or anything. I think I've said enough - we're going to try a REAL memory foam mattress topper and if that doesn't help, we're going to have to fork out the money for the tempurpedic. I think Overstock.com gives a fair and accurate description of the product, I just wish I didn't put so much faith in all the reviews I read. Perfect- a skeptic no more! I was skeptical and nervous about buying a foam mattress. Our bed was a top of the line pillow top but we just couldn't sleep anymore. This 4lb foam is the most comfortable mattress that we have ever slept on . We put it on a platform bed, opened it, and waited 8 hours before putting the sheets on. It took it about 2 days to reach it's full height so don't be alarmed and think they sent you the wrong size! I love to sleep on my side, but my hips would hurt all night. I can now sleep on my side with 90% of the pain gone (it relieves pressure, unfortunately it can't cure arthritis!) My husband use to toss and turn and eventually go to the couch. He has not slept once on the couch since we got the mattress and when he does move around, I can barely feel a thing. Another odd thing is that he hasn't snored since we got the new matress either, really strange and I have not read anywhere that this is supposed to happen, but there it is, 3 months and no snoring! On a personal note, my husband has had knee surgery and his knees would hurt when we were intimate. Now he has 0 pain because the mattress absorbs weight instead of having springs that push back. Do research on the # of pounds that you need for the way you sleep. 4lb is supposed to be for side sleepers, but my husband sleeps on his back and loves it. Well, I hope this helps in your research for a foam bed. People are tired of hearing about my mattress!!! THIS IS THE BEST MATTRESS!!!!!! IT IS SO COMFORTABLE I DON'T WANT TO GET UP IN THE MORNING. I HAVE TOLD ALL MY FAMILY AND FRIENDS ABOUT THIS GREAT DEAL. THANKS OVERSTOCK! I have been looking at these for some time and when I came across this we could not pass up the price. We really do like it however when purchasing it they could not tell us if it was considered FIRM or PLUSH. It is FIRM for sure. Very comfortable but if you prefer plush this is not for you. The smell is lingering - each day a little better. Also it does not look exactly like the picture - you can't see the definition of the pillow top becuase it is encased in a cover. I purchased this mattress in September of 2008. When I first slept on it I was in heaven. It was the most comfortable mattress I'd ever used. However my satisfaction was short lived. Within two months there was an indent of my body where I slept. Over the next 3 years I constantly changed positions but that created other indentations. It now resides in a recycling facility. I've since learned that it's important to know the weight of the foam. I unfortunately had purchased a lightweight unit and it was destined not to last. I urge you to read the VERY helpful buyer's guides that Overstock includes for most products. They could have saved me lots of money. Unless it's for a guest room that's rarely used, this mattress won't hold up. This mattress has permanent indentations in it after only about 1.5 years, I am very displeased with this. This mattress was great for the first 45 days. Then it begins to leave body impressions in mattress. The form collapses and you have deep impression in mattress. Does not support your body weight like it did for the first 45 days of use. Would not buy this mattress again. I can't sleep on anything else now. After sleeping on my memory foam mattress. This mattress was an okay buy but a little firmer than I expected. Nice and high off the floor, as it's 14 inches, but have had a lot of back problems after getting this mattress. Very comfortable. I love it, firm and soft together. This is the second time I have purchased this item. If you like a memory foam mattress, this one is an excellent value, but if you prefer a firm regular mattress this is probably not the best choice for you. I use this mattress in guest rooms and my guests have reported a comfortable sleep. We bought this mattress years ago and it held up beautifully. Super comfortable. We have had this mattress for 9 years. Just in the last year or so has it started to break down. "I would like to order this exact same mattress for a different room. Which new mattress is the equivalent of this one? There are two options for sale and one is a bit more expensive, but I am more concerned about getting the exact same bed. We are going on 6 plus years with our first and still love it!" Hello karenf2008, I would recommend something like item number 16989935 or 11514728. Thank you for shopping with us! "When I purchased this I thought there was a warranty with it? Can't seem to be able to find it now?" We will have someone from our Customer Care Department contact your regarding your order and to provide your with this information. I didn't get anything in writing for this mattress. Yes, I too thought the description said there was a ten year warranty, but I didn't get any paperwork with the delivery. When the bed started to trench, I contacted Overstock about the warranty and was told there was none.